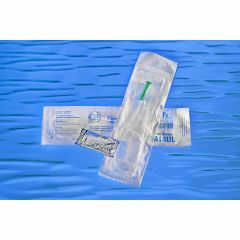 Cure Medical Male Pocket Intermittent Catheter Lube 14Fr 16"
Cure Medical Male Pocket Intermittent Catheter with Lube - 14Fr. 16"
it's packed in a bend. Take with you. Middle of night. still young in heart. Active Geezer. Active . The material is smooth, and I can tell the difference. The only smoother material is a red rubber spritzed with sterile saline before the lubricant. I use it at nite if I have to go. It's quicker than my daytime catheter. discreet. convenient. all in one package. My husband is very happy with this product. Much easier with everything in one packet. The product is excellent.. The product is excellent.. Easy ordering method.. Delivery is quick.. Price is good..
Not on Insurance PP list. 76 yr old male contractor. Allegro Medical is not on my insurance's PP list so even though your product is cheaper, I pay more because my insurance pays less. I would like to continue with Allegro Medical but I'm going to switch to a company on my insurance's PP list. Active 65 yr old male. Easy to carry in your pocket and store in your car&acirc;&#128;&#153;s glove compartment. I've used several different catheters in the past year and a half. This pocket packet is awesome, does not damage the urethra walls, leading to other issues. The lube packet of 3 grams is plenty and can be 2 grams, but better to have more just in case. I've tested and used temporary other caths (waiting on my Cure Cath order)and after 3-7 uses of the other brands it is the eyelets that rip and cause soreness and tenderness and bleeding. As soon as i start using Cure MU14F unit, after the 4th use the healing starts and the stinging goes away, the soreness gone, and bleeding stops. The EYELETS are SMOOTH AS SILK! Is the material these are made of fairly rigid, or rubbery/flimsy? I have a urethral stricture which needs something semi-rigid to pass through it, but I like the idea of the polished eyelets. Might save me some pain.